Frequently asked questions about the benchmarks for tertiary organisations. The Career Development Benchmarks: Tertiary aim to provide a common understanding of what effective career development practice in tertiary education looks like. increase the proportion of 25- to 34-year-olds with advanced trade qualifications, diplomas and degrees (at Level 4 or above). The benchmarks will be regularly reviewed and updated to ensure they remain relevant and useful. How were the benchmarks developed and tested? Careers New Zealand set up a project team to develop and test the benchmarks, which were reviewed by an external reference group and international career experts. This group met twice to review the project and examine drafts and feedback received from testing. Members of the external reference group also assisted with consulting other members of their organisations, and helped those doing testing. Once the external reference group approved the first draft, the benchmarks were field-tested throughout the country, involving approximately 65 organisations, including over 170 people. There was also the option to give feedback online and 32 people chose to do this. The benchmarks are based on New Zealand and international research and findings on effective practice in career development. They contain a full reference list and bibliography. Who was involved in developing the benchmarks? Careers New Zealand seconded Shaun Pulman from the University of Auckland, as lead writer. The project team also consisted of Dale Bailey, project executive, Julie Urbahn, project manager, and Jennifer Ross and Mariella Trynes, team members. Two Australian career experts, Dr Mary McMahon and Col McCowan, also peer-reviewed the document. The development process integrated thinking from key Ministry of Education strategies, which are an intrinsic part of the benchmarks model. Why do you have different assessment levels? The benchmarks are aspirational. Consolidating effectiveness and highly effective levels indicate what best practice looks like. The highly effective column is designed to be a reach for tertiary organisations. 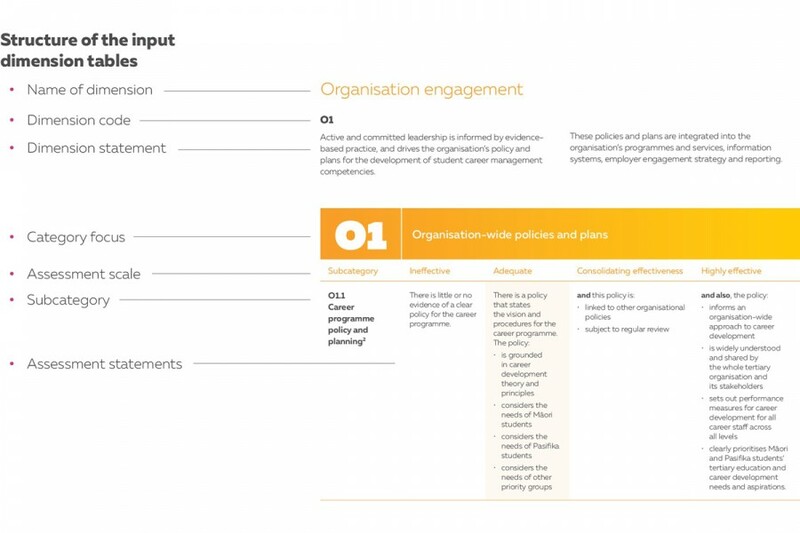 The adequate level is highlighted as this is the minimum level that we would expect organisations to be performing at to achieve effective career development practice. Having different levels recognises varying degrees of achievement, and enables organisations to identify their strengths and areas for improvement. Why do you have an “ineffective” assessment level? It is important to acknowledge where practice is not adequate. It will highlight areas of immediate concern and enable tertiary organisations to develop a plan to ensure they are at least meeting the minimum requirements for effective career development practice. This approach is similar to that used in other Ministry of Education effective practice rubrics, most notably the Measurable Gains Framework. What if we don’t fit neatly into an assessment level? Some of the benchmarks contain more than one requirement at each assessment level. It is possible that you will not meet all the requirements. You should start at the adequate level and ensure that you meet these requirements as a minimum. If you meet elements in the higher assessment levels, indicate these as this will enable you to clearly see what you need to do to reach the next level. Rate yourself at the level where you meet all the requirements. What if our students have not reached the level of competence outlined? We acknowledge the diversity of the tertiary sector and understand that some organisations may want to refer to the competencies in the secondary benchmarks as their first reference point for some students. What if we are ineffective in some aspects of our programme? It is up to tertiary organisations to determine and implement their development plan as a result of their self-review. If your self-review identifies areas that are ineffective in any subcategory, we would recommend these are the areas to prioritise in your action plan. Keep a lookout for Careers New Zealand cluster groups and regional workshops that focus on aspects of the benchmarks. These are excellent information and job-share opportunities. Do tertiary organisations have to use the benchmarks? No. The benchmarks are a self-review tool for organisations to use. They provide a framework of what is required for effective career development practice in tertiary organisations. They are designed to inform your organisation’s practice, not prescribe it. However, tertiary organisations are strongly encouraged to use the benchmarks. A consistent approach to career development across the sector will improve outcomes for our young people, and will also ensure alignment between career development provision at secondary school and tertiary levels, making for smoother transitions for students. Are the benchmarks an appraisal document? No. They are a self-review tool for an organisation’s career development provision, and are not designed to be used as a professional appraisal tool in the context of the career specialist’s role. They are not a set of professional standards – they describe requirements for successful programmes and services, not the role of the staff. Are the benchmarks linked to funding? No – the benchmarks are purely a self-review tool. The benchmarks indicate that good practice is to have open and transparent discussion of resource allocation, and that those decisions must reflect the needs of students. Why do the tertiary benchmarks suggest career specialists should have a Level 7 qualification, where secondary benchmarks suggest Level 6? Specialists in the career development field recommend a Level 7 qualification, as this is generally felt that it sets the professional standard for the tertiary sector. What do we do if our organisation is too small to provide a suitably skilled career specialist and team? How will Careers New Zealand continue to provide support? Careers New Zealand will work alongside you to support you in using the benchmarks, developing an action plan, and improving your career development practice. We will not conduct self-reviews for your organisation, but we will work alongside you to use the benchmarks, develop an action plan and improve your career development practice. How else can we use the benchmarks? By reviewing and documenting areas of strength through the self-review process, you can use them as success indicators for reporting purposes.